Spinal decompression is a traction therapy that uses gravity to take pressure off your problem areas, allowing you to heal. 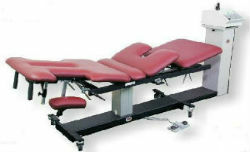 The Kennedy spinal decompression technique utilized at our office starts with a special table to put you in the precise position that will allow for the specific treatment of your health concerns. You’ll be comfortable and relaxed while your body starts to heal. After a significant amount of research, Bryant Family Chiropractic chose the Kennedy Decompression Neural-Flex System which we believe is the most technologically advanced, state-of-the-art decompression system in the world. Dr. Reed possesses the expertise needed to understand how to help those experiencing a variety of conditions. We’ll start with a thorough assessment to know how best to position you on the table. Preprogrammed patterns will alternate between distraction and relaxation to stimulate disc healing. We want to make it easy for you to learn if you are a candidate for spinal decompression therapy. Just contact us at (501) 847-0868 and ask to speak to Dr. Reed. That’s right, Dr. Reed will talk to you personally to help you make the right decision.